Two Projectors and Image Blending by John Neville Cohen. Page 7 of ten pages. 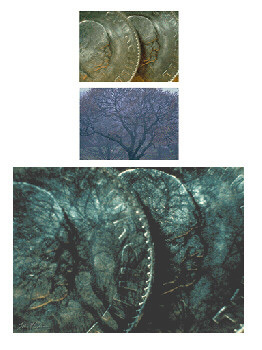 A far more sophisticated technique for combining images is preferred, because so many more exciting possibilities exist. This method involves using two projectors, but one has then an exciting way of blending any two previously created pictures, with far more control! The technique is simple, just project both images separately on to the same choice of screen. However, these images can now be positioned which ever way one might wish, one image could be much larger than the other, or by masking parts of each image, a different blend of the two pictures can be created. This is how any parts, of any picture, can be blended together and all the time one can see exactly what is to be photographed. The main disadvantage of the sandwich technique is that there is no allowance for selective shading, masking, or changing colours of part of one, or the other image. One has to accept the full influence of the one image on the other as they exist. Instead of sandwiching the two pieces of film, project them separately at the same screen to overlap each other. Best of all, the combined images are there to be seen all the time, until the desired result is formed. There is no need to rely on guesswork, as so many other special effects seem to demand, with these methods no film really should ever be wasted. 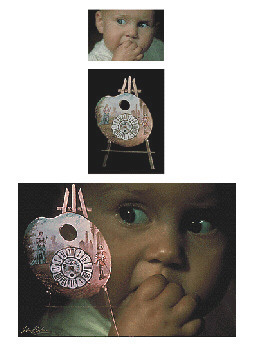 To demonstrate the different options let us start with plate 24 Children's hour (above). The portrait was projected, whilst a photograph of the clock (taken against a black background) in the second projector, was aimed to overlap the portrait. The advantage of scale has been used here, as really the clock face was larger than the baby. This was easily done with a zoom lens otherwise it could also have been achieved by altering the distance between the screen and the projector. Sometimes there can be a problem of one image appearing far brighter than the other. This can happen if one photograph is denser than the other is, or if one projector is that much closer to the screen. This is a problem that can be tackled two ways. The first method is to mask close to the front of the projector lens, projecting the brighter image, to darken it. The other way is to double expose with the camera. Simply block the light from one projector, expose the first image, then block the other projector and take the second exposure, corrected for the brightness. Plate 23 (below) is only mentioned to demonstrate how solid objects, such as the Churchill memorial crowns, can be made to appear transparent. 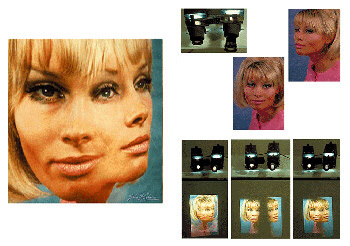 Projecting two transparencies, each a portrait of Susan created the plastic surgery effect plate 25 (below). These were carefully aligned so that the two nearest eyes exactly overlapped each other. It was then just a case of carefully masking away the parts of each portrait projected that was no longer required. With two projectors it becomes possible to mix film effects together in a way not possible before. It is so easy to blend negative images with transparencies, in colour, or black and white. Instead of transparencies in both projectors, one of them could be projecting a black and white negative, or a colour negative just as easily.